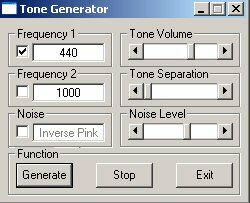 This program is designed to generate audio tone(s) using your sound card. It can generate one or two tones, and/or pink noise, simultaneously if desired. Generating two tones simultaneously can be useful to check intermodulation distorsion in audio or radio equipment. The performance is completely driven by the sound card you are using. This program uses DirectSound (a Windows component) to generate sound.